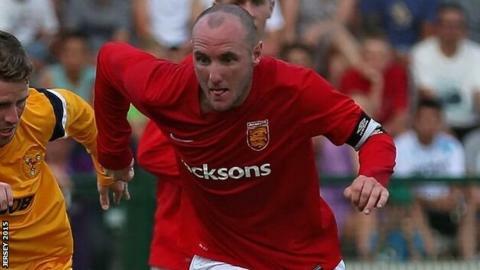 Guernsey FC's attempts to sign Jersey captain Luke Watson are being thwarted by the island's housing licence system. Guernsey manager Tony Vance said last month that he expected Watson to sign for the team - who play in the English eighth tier - this season. But to come to the island and work, people must obtain housing licences. "He's got to find a job and there's licence restrictions. That's probably the thing that's causing the problem," Vance told BBC Radio Guernsey. Watson plays for Jersey champions St Paul's, who won every trophy they entered last season and have either finished first or second in the island's Premiership every year since 2007. But Vance says Watson, who led Jersey to victory over Guernsey in this year's Muratti at Footes Lane, is still keen to join the Green Lions, who play in the Isthmian League Division One South. "If I picked up the phone to Luke and said 'come on over' he'd be here like a shot, that seems to be the message when we've been discussing it," added Vance. "We're trying to look for ways where we can help him, but at the moment he is where he is."